The Medicare Access and CHIP Reauthorization Act of 2015 (MACRA) was signed into law on April 16th, 2015. This law is intended to promote greater value within the healthcare system, in terms of better quality care and reduced costs, repealing the Sustainable Growth Rate (SGR) and sunsetting the Physician Quality Reporting System (PQRS), Value-based Modifier (VM), and EHR Incentive Program (MU). The MACRA combines the intent and value of these legacy programs into two optional tracks available to clinicians; these are known collectively as the Quality Payment Program (QPP). Advanced Alternative Payment Models (Advanced APMs), which provide a 5% lump sum bonus to Qualifying APM Participants (QPs). The Centers for Medicare & Medicaid Services (CMS) has designed flexibility and tractability into the initial performance period (CY 2017), calling it the transition year. 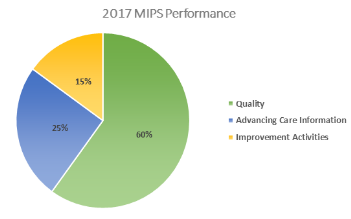 For MIPS, the transition year comes with a Pick-Your-Pace method, or for APM participants, an opportunity with Advanced APMs. For MIPS, the performance threshold has been lowered, so only those uninterested in submitting any data will see a negative payment adjustment in 2019. 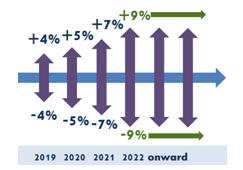 Otherwise, the potential for positive adjustments is great, given potential maximum adjustments will increase each year, from 2019 - 2022. Depending on the direction of an entity, given its resources and patient population, qualification in the QPP may vary. Meet the various criteria for APM participants, to take part in Advanced APMs, or meet the Medicare Part B billing and patient thresholds, to participate in MIPS. For more information on eligibility for MIPS or APMs, visit CMS' Innovation Center, Quality Payment Program site, or reach out to MIE. The QPP outlines incentives based on performance, whether it is through a demonstration or structured payment model or through meaningful participation in MIPS. 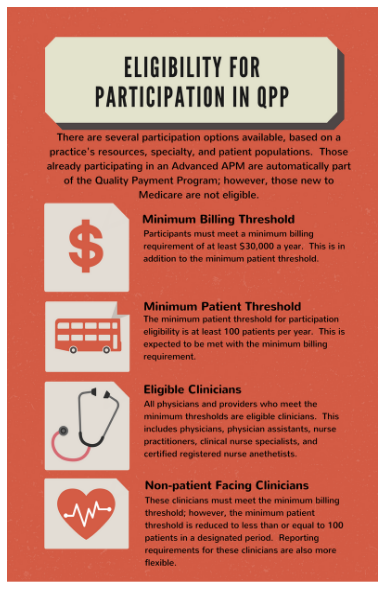 When participating in traditional APMs, entities receive the potential MIPS adjustment on top of the expected APM-specific rewards. If the QP, however, is in a qualifying Advanced APM, he/she not only receives the APM-specific rewards, but will also receive the bonus 5% lump sum. This incentive is based on the notion that clinicians taking on additional risk related to their patient outcomes are expected to receive great rewards, in the long run. Six (6) measures, including an outcome measure, weighted at 3-10 points each, for 90-day minimum. Assessed through claims data, with a maximum of 10 points per episode cost measure. 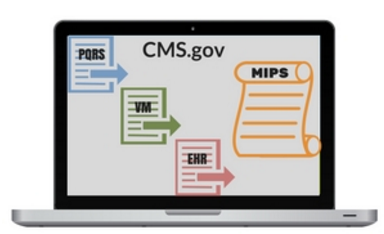 Submit up to 9 measures (5/4 required, based on EHR certification) for a 90-day minimum. There are two measure sets to choose from, based on Edition certification. Accounts for half of the overall 25%, and MUST be met in order to score at all. Accounts for up to 90% of the overall 25%. Accounts for up to 15% of the overall 25%. Up to four (4) improvement activities for a 90-day minimum. Given the built-in leniency of 2017 reporting requirements and the ability to Pick Your Pace, MIE wants to ensure all options are available to our clients, from the onset. 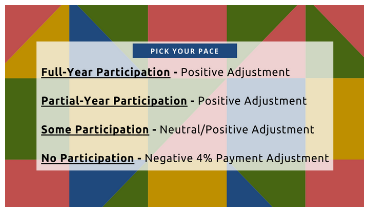 The first step in determining your pace is knowing what type of payment adjustment you want. With that, you determine your participation rate, and leave the rest to MIE. Enrolling, or opting in from within WebChart, is currently no different than previous years, and though updates to WebChart's enrollment process are slated for early 2017, do not be leery of the original Meaningful Use Setup. As the comment period comes to an end and measures are finalized, MIE will be updating the applicable measures to reflect the Advancing Care Information, Improvement Activities, and Quality categories. But in the meantime, do not stop your current processes. In order to capture the necessary data, continue your workflows as before. 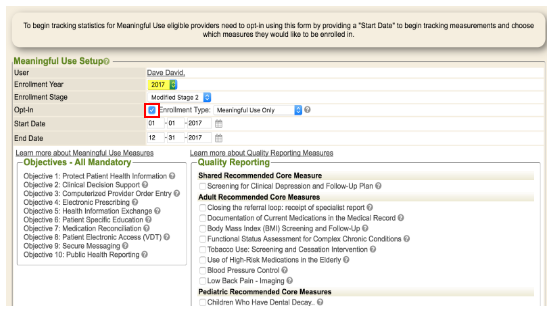 Click Opt-in from within the Meaningful Use portlet. Change the Enrollment Year to 2017. Send us your questions, call us with your concerns; expect updates as they come available, and know MIE has you covered around every turn.